Cells discoid or barrel-shaped , with concentrically undulate valves that produce either a convex (scutate) or concave (lacunate) valve face. Valves appear undulate in girdle view in the LM. 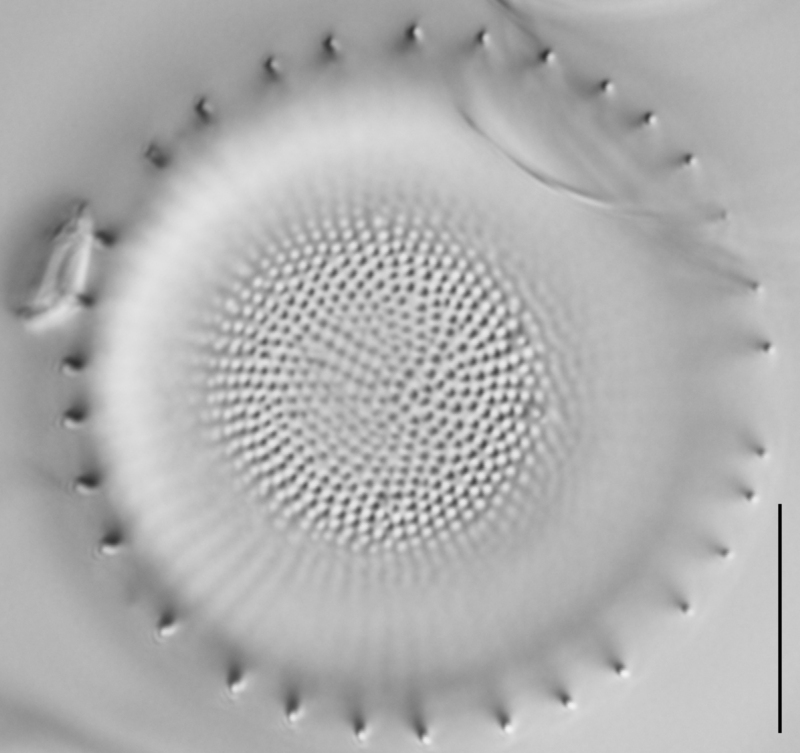 A ring of spines is present around the valve face, occuring in a single row at the end of every second or third costa at the junction of the valve face and mantle. 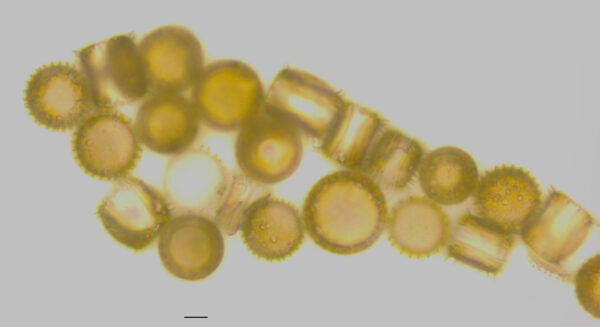 Areolae are arranged in radiating striae separated by raised hyaline costae. In the valve center the striae are uniseriate, towards the margin striae become biseriate or triseriate. 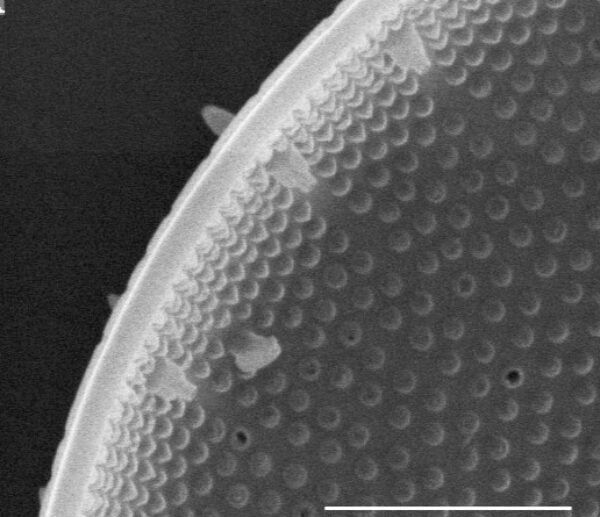 Areolae appear round or angular in the SEM, and round in high focus in LM. 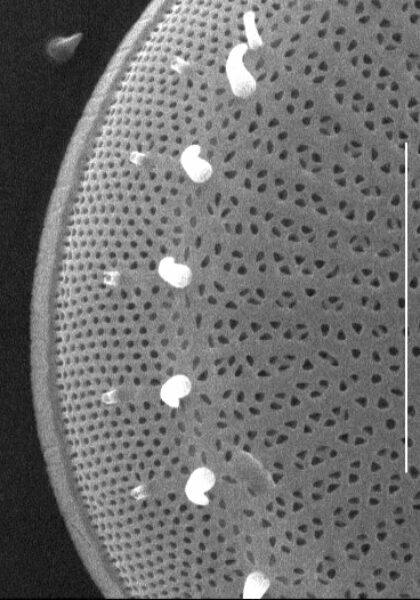 Convex domed cribra close the internal opening of the areolae. Fascicles closely spaced, separated by thin costae (also termed hyaline interfascicle). There are 7-9 fascicles in 10 µm, and 11-20 areolae in 10 µm. Every second or third interfascicle with a spine continues over the edge of the valve onto the valve mantle. Spines are curved and tapered, with a sharply pointed tip. Marginal fultoportulae are present, arranged in a ring around the mantle, always occurring beneath each spine; central fultoportulae occur at the center of the valve face, singly or in a ring. The fultoportulae have 3 satellite pores and external buttresses. One or a few rimoportulae occur on the mantle-face junction. 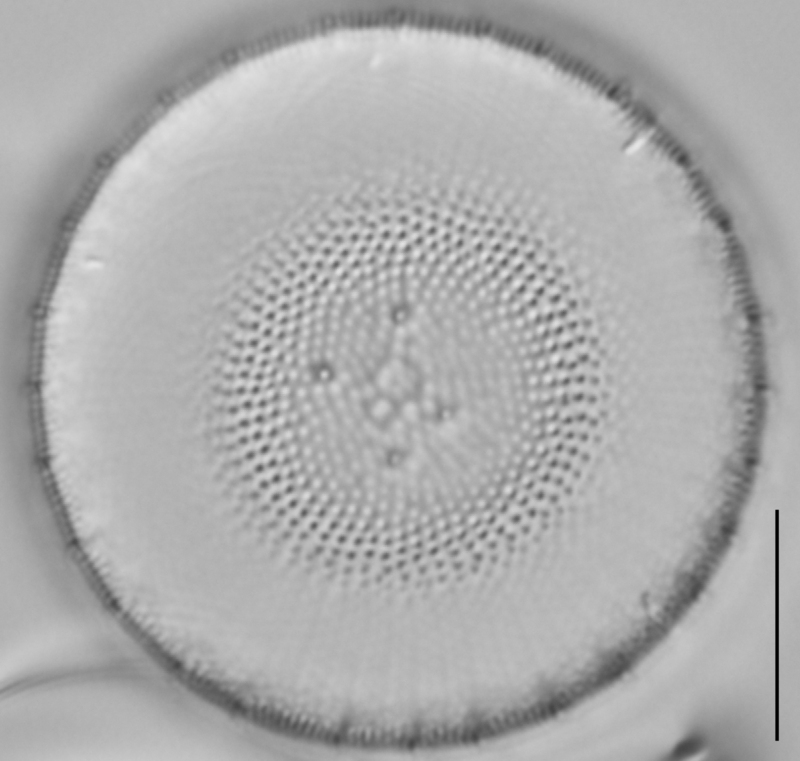 The rimoportulae have tubular external extensions that superficially resembles the spines. The rimortulae, however, are positioned slightly abvalvar the ring of spines. 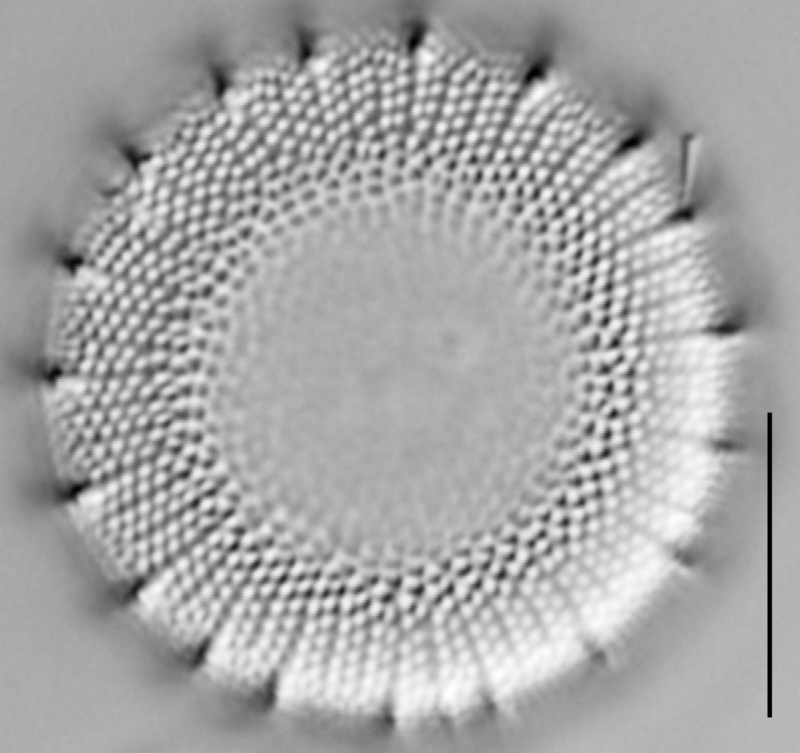 Rimoportulae are difficult to distinguish in LM, but they are shorter, straighter and less tapered than spines. 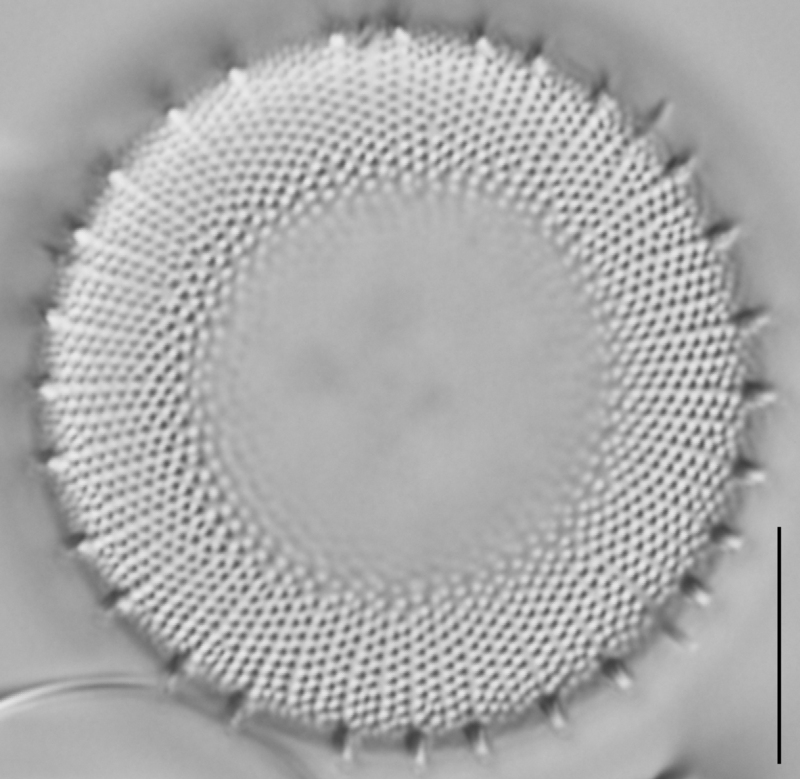 Stephanodiscus niagarae was collected in a plankton tow sample from Grove Lake, Antelope County, Nebraska. The lake habitat temperature was 20.7°C, the water conductivity reached 293 µS/cm, DO showed 7.1 mg/L, and pH showed 9. 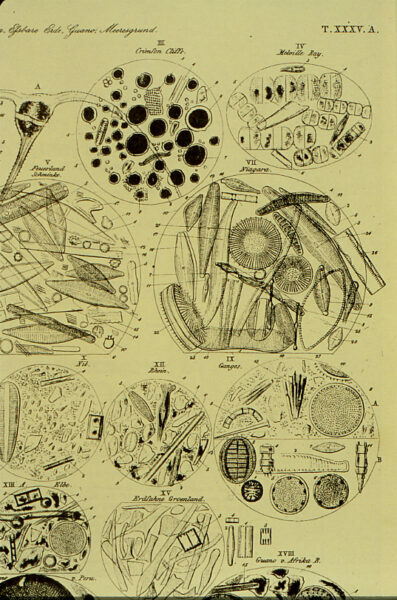 In specimens from the Iowa Lakeside Lab Herbarium, S. niagarae was found in planktonic and epipelic samples of West Lake Okoboji, Little Miller’s Bay, Fork Des Moines River, and North Spirit Lake in Iowa. 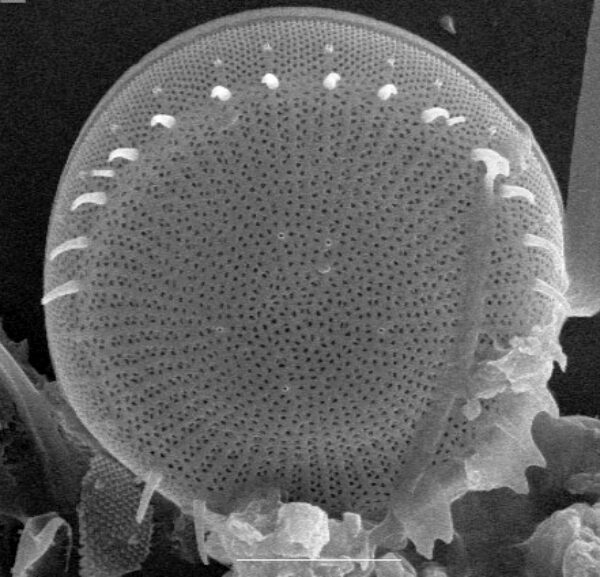 Stephanodiscus niagarae Ehrenberg is a common living and fossil diatom in North America, and occasionally dominates phytoplankton assemblages in lakes throughout North America. Populations in the Great Lakes has been reported ranging from 20 µm to > 100 µm in diameter (Theriot 1983 in Stoermer & Sicko-Goad, 1985). It is abundant in North American Quaternary fossil deposits and also has been reported as a fossil from Asia, Africa, and Europe. 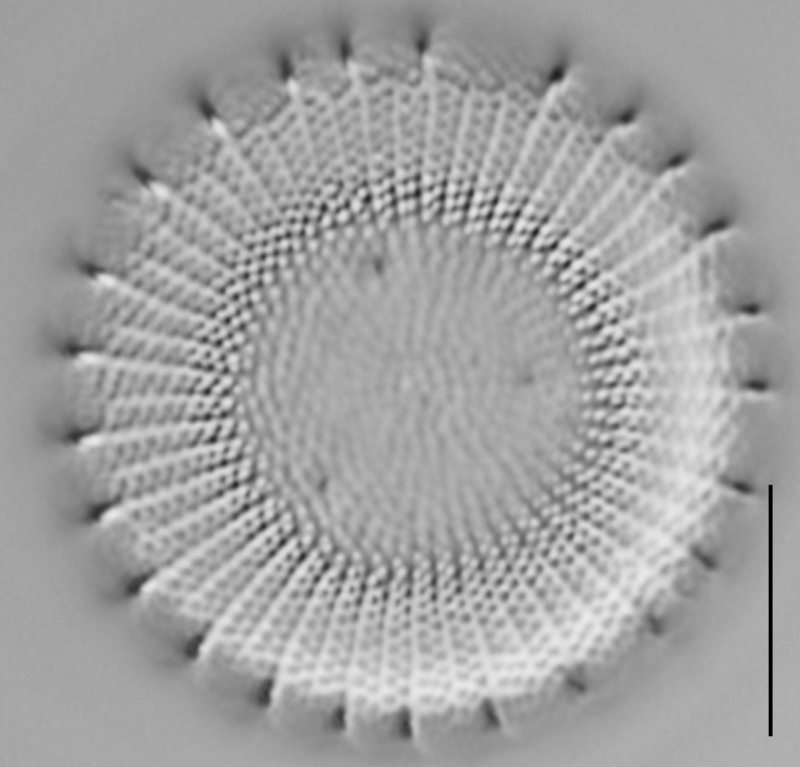 Stephanodsicus niagarae was found in a paleolacustrine deposit in Jingyu County, Jilin Province, northeastern China; the central fultoportula count is roughly intermediate between that for living North American specimens of S. niagarae and fossil European specimens of the type of S. rotula, suggesting the possibility of evolutionary intermediacy (Theriot et al., 1988). A study of correlation matrix of 16 characters of 129 S. niagarae specimens from 14 lentic North American habits revealed variation in silification; larger valves more heavily silicified than smaller ones, and specimens from lakes with high ambient silicon: phosphorus ratios were more heavily silicified (Theriot, 1987). Edlund, M.B. and Stoermer, E.F. (1991) Sexual reproduction in Stephandiscus niagarae (Bacillariophyta) Journal of Phycology 27(6): 780-793. 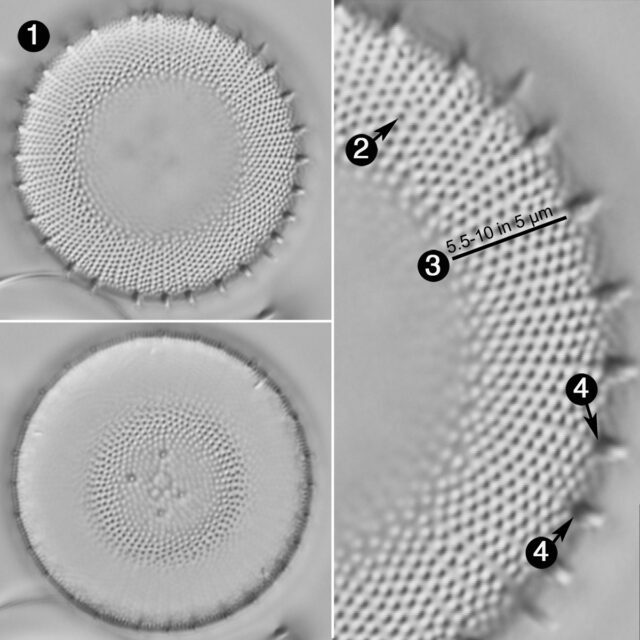 Stoermer, E.F. and Sicko-Goad, L. (1985) A comparative ultrastructural and morphometric study of six species of the diatoms genus Stephanodiscus Journal of the Great Lakes Research 7 (1): 125-135.